Make the green tuna in quick time and put the potato in the oven while you play some games or take the children to see the neighbours, if they haven’t already turned their lights out, to pretend they aren’t home! Preheat oven 190°C/fan 170°C/gas 5. Pierce the potatoes deeply several times with a fork, then place them directly on the oven shelf. Cook for about 1 hour and 15 minutes, or until soft and cooked through (stick a knife in one to see if it’s tender). 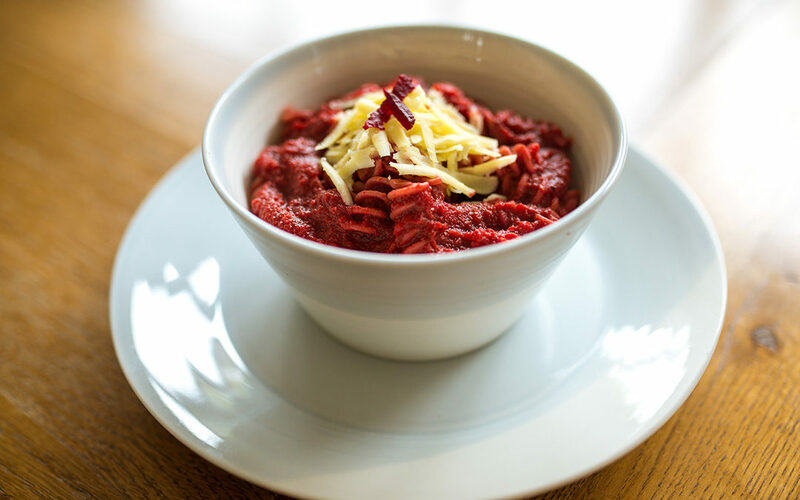 For the green tuna, put all the other ingredients except for the tuna into a small food processor (or in a small bowl and use a hand held blender). Blitz until combined, give it a few stirs in between. Add a few drops of water if necessary. 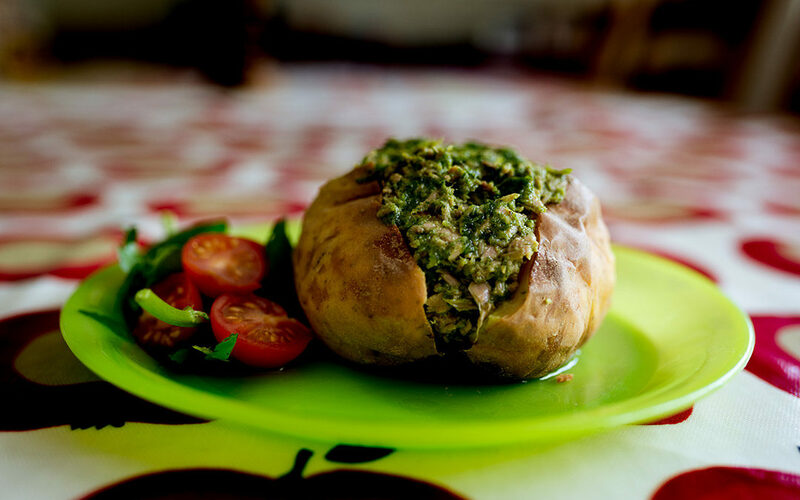 Once the potatoes are cooked, slice them open, fill with the green tuna and serve. * For a crispy skin, coat the potatoes in olive oil and rub with a little sea salt. Something a little different for the Halloween season, with lots of vitamin C-packed veg to help fight off the autumn cold. 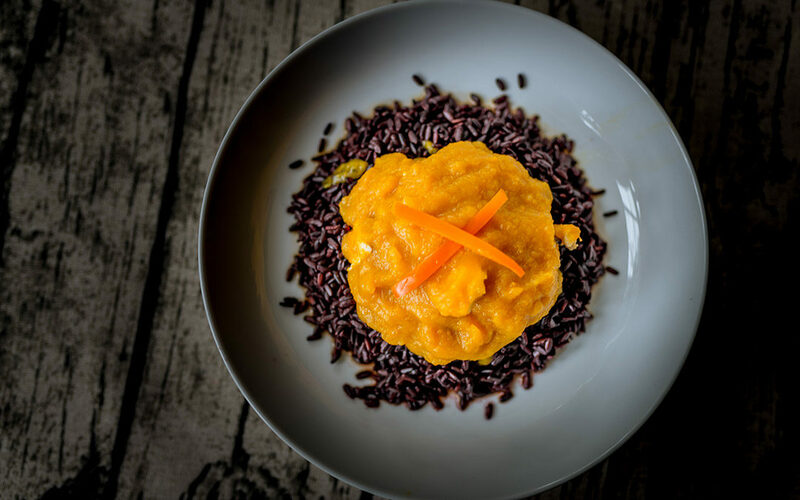 The black rice is a favourite in our house, but it does take longer to cook so I usually save it for the special occasion or just when time permits – meaning when I remember to get it on in time! Rinse the rice with cold water, then put it in a big saucepan of water. Bring to the boil, then turn the heat down to low–medium and simmer for 40–45 minutes, or until the rice is tender. Meanwhile, put the vegetables and stock in a large saucepan with a lid. Bring the pan to the boil, then simmer, covered, for 30 minutes. Pour the oil into a frying pan and lightly fry the chicken until turning golden and cooked through. Blend the vegetables and stock with a hand blender, leaving some chunks of veg. Add the chicken and orange juice, if using, and cook for a further 5 minutes. Once cooked, drain the rice and place in the bowl. Pour the orange sauce over the rice and serve. * To peel a pumpkin or butternut squash you need a really good peeler; if you don’t have one you will need a sharp knife to chop away at the edges. For a vegetarian meal, swop the chicken for tofu.